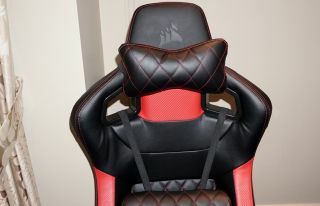 A racing car seat for your gaming setup. Gaming chairs are seemingly becoming all the rage these days, and Corsair is jumping into the market with its own T1 Race, a modified chair from a company which normally makes seats for racing cars. According to Tom's Hardware, the chassis is made from steel, while the arms are made from plastic but have a carbon fiber looking finish to them. As for the part you'll be sitting on, PU leather is used to keep costs down versus using actual leather. All this means the T1 Race will cost you $350, which is about average for chairs of this kind. It's not available yet, but it is "coming soon." Corsair is still working on the kind of caster wheels it'll be using on the final product, so once that's out of the way, expect a full release to follow.